Researchers have used CRISPR, the genome editing tool, to speed the inheritance of specific genes in mammals for the first time. Demonstrated in lab-reared insects several years ago, this controversial “gene-drive” strategy promises the ability to quickly spread a gene throughout an entire species. It has sparked dreams of deploying lethal genes to eradicate pests such as malaria-carrying mosquitoes—and now, perhaps, crop-damaging, disease-causing mammals such as rabbits, mice, and rats. In a variation of the earlier fly work, the UCSD researchers built their gene drive by engineering female mice to carry the gene for the DNA-cutting enzyme Cas9, one of CRISPR’s two components; they engineered males to carry a gene for the other component, the guide RNA (gRNA) that shuttles Cas9 to a specific target on a genome, plus a gene that modifies coat color. 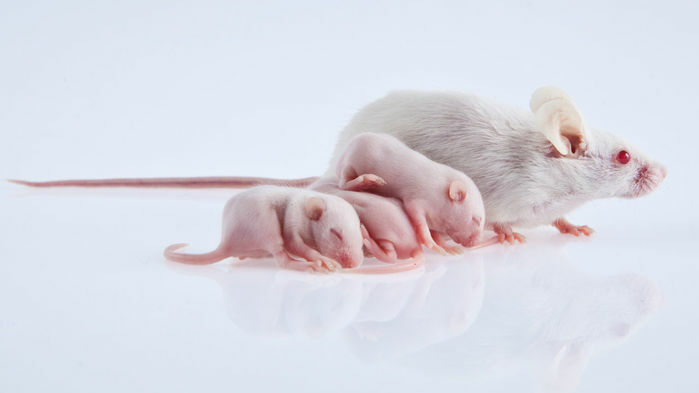 Breeding the altered mice created pups that had the genes for both CRISPR components on different chromosomes. After Cas9 makes its cut, a cell repairs the damage—and how it does so is key to the success of a gene drive. The cell can either reconnect the severed strands of DNA or bridge the gap by slotting in chunks of new DNA, a process called homology directed repair (HDR). A gene drive harnesses HDR to insert a new gene—in this case, a copy of the coat-color modifier gene. But cells naturally prefer to simply reconnect the severed DNA, which thwarts a gene drive. The UCSD team exploited a fundamental biological phenomenon to force cells toward HDR. They manipulated Cas9 to turn on during meiosis, the cell division process that helps create sperm or eggs. The chromosomes naturally swap DNA during meiosis, and during those exchanges the cell only allows HDR. Cooper and her colleagues write that this system of “active genetic elements” could speed the creation of mice that have several introduced or crippled genes. Michael Wiles, who heads tech evaluation and development at the Jackson Laboratory in Bar Harbor, Maine—one of the world’s largest commercial producers of engineered mice—says the method could be “very useful,” as many human diseases are caused by aberrations in several genes, and producing mice that genetically mimic those diseases is slow and laborious. “I’m now getting requests to make mice with six modifications, and the breeding time becomes phenomenal,” Wiles says. With a gene drive like this, what takes 5 years could be done in one, he says. Even though this new work aims only to engineer lab mice, Kevin Esvelt, an evolutionary biologist at the Massachusetts Institute of Technology Media Lab in Cambridge, says it concerns him. He believes a gene drive that could be released into the wild should include a kill switch to shut it down and restore animals to their natural state. “It’s troubling to see that the study does not explicitly mention safeguards,” Esvelt says. The new UCSD gene drive, however, likely would stop spreading in a mouse population after a few generations. Because the genes for Cas9 and the gRNA ride on different chromosomes, they would gradually become separated and the drive would lose effectiveness. In the preprint, Cooper and her colleagues stress the continuing challenges of creating an efficient gene drive for wild mammals. “[T]he optimism and concern that gene drives may soon be used to reduce invasive rodent populations in the wild is likely premature,” they conclude.